Designed to achieve a myriad of cajon sounds. The Cajon Bru-llet marries elements of a brush and a mallet to brilliantly translate both slap and bass tones to the cajon! Hickory shaft with medium-stiff plastic bristles and a 1.5 in. mallet head made from XLPE foam. Designed with functionality and musicality as the top priorities, Vic Firth’s new cajon products are the industry’s first fully dedicated cajon implements. “For all the cajon brushes out there, we were surprised to learn that very few of them actually address the unique needs of this emerging instrument!” states Neil Larrivee, Vice President of Education and Drum Stick Product Development for Vic Firth Co.
With its roots in Afro-Peruvian tradition, the centuries-old cajon has seen a major resurgence, becoming the darling of the contemporary music scene. 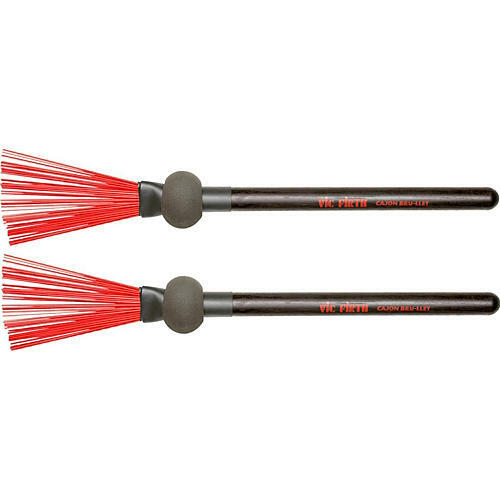 Portable and versatile, it is one of the most exciting percussion instruments of our time! This is a pair.